When you want the kind of carpet that can do it all, there’s no better option than Mohawk SmartStrand Silk Carpet™. #1. It has built-in stain and soil protection that will never wear or wash off. 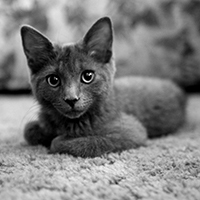 There are many carpets these days that come with built-in stain and soil protection. But, typically, it is applied chemically after manufacturing is complete, and it can wash off with cleanings or wear off over time. As that protection wears off, it has to be reapplied over and over again, and if you fail to do so, the carpet will be more and more difficult to clean as time goes on. The soil and stain protection in this incredible carpet will never wash or wear off because it is built into the carpet during the manufacturing process. 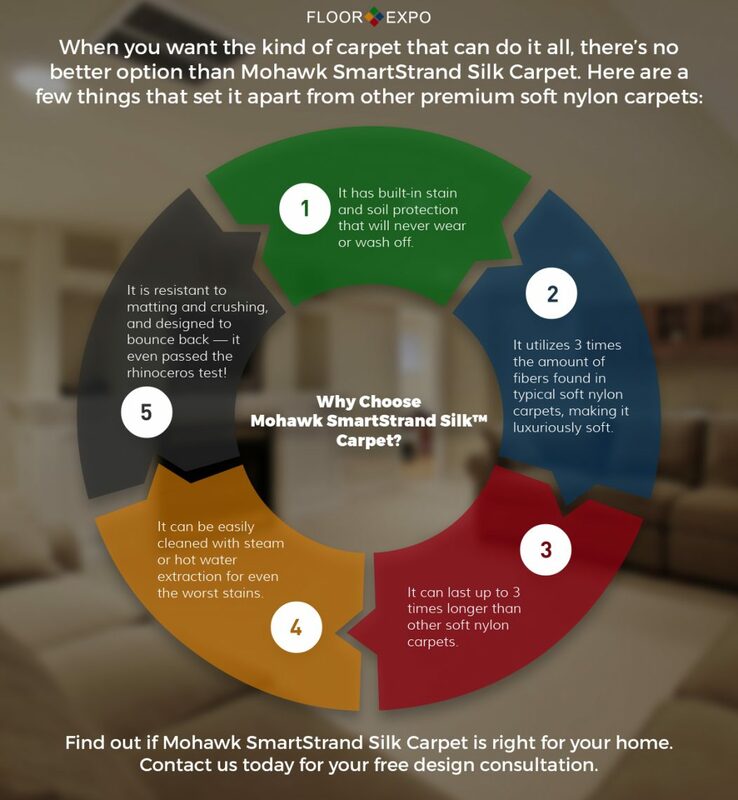 You’ll be able to rely on the soil and stain protection in your Mohawk SmartStrand Silk Carpet for the life of your carpet, and there’s no other carpet that will provide that same level of protection available on the market. SmartStrand Silk carpet is made with yarn that has three times the typical amount of fiber that is found in most soft nylon carpets, and the result is luxuriously soft carpet that you’ll love to wiggle your toes in. In fact, it’s preferred five to one over other premium soft nylon carpets, and once you feel it for yourself, you’ll immediately understand why. #3. It provides long-lasting beauty. As we mentioned in the very beginning of our blog, when you’re spending your hard-earned money on new carpet, you want to get the most out of your investment, which means that you want your carpet to last. When you want longevity, SmartStrand Silk is an excellent choice because it will stay beautiful for up to three times longer than other soft nylon carpets. #4. It’s easy to clean. Because the soil and stain protection in Mohawk SmartStrand Silk Carpet never wears or washes out, it makes it so much easier to maintain than traditional options. Regardless of whether you’ve spilled mustard, coffee, or even red wine on your carpet, a simple steam clean or hot water extraction is all you need to make your carpet look new and spotless once again. You’ll never need to use any detergents, soaps or chemical carpet cleaners with SmartStrand Silk carpet. #5. It’s designed to bounce back. Stains aren’t the only things that threaten the beauty and longevity of your carpet. Matting and crushing can also cause big problems, and typically, they are much more difficult to fix than most stains. But luckily, the carpet fiber in Mohawk SmartStrand Silk Carpet is specifically designed to deflect any matting or crushing, and to bounce back beautifully. How do we know this? Because Mohawk put their carpet to the ultimate test — the rhinoceros test! For the test, Max, the 5,400-pound rhino from the Birmingham Zoo, lived a life of luxury on Mohawk SmartStrand Silk Carpet, as well as a competitor’s premium soft nylon carpet. After two weeks of abuse, the SmartStrand Silk carpet was professionally cleaned, and no stains or signs of wear remained. Is Mohawk SmartStrand Silk Carpet right for your home? There are so many reasons to choose SmartStrand Silk Carpet when it comes time to replace your carpets in your home. 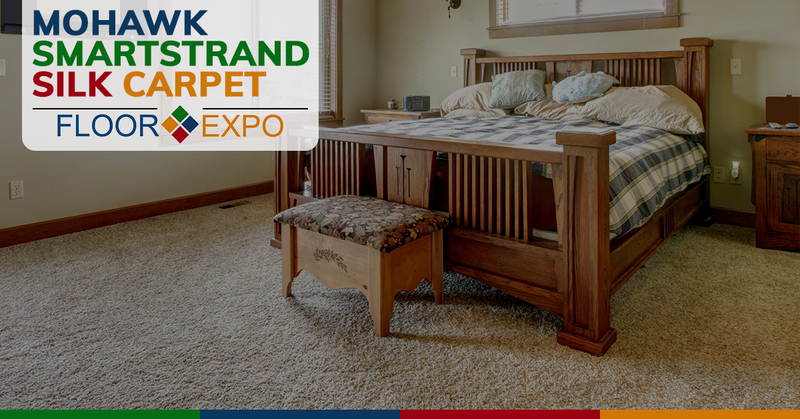 But, no matter if you’re interested in SmartStrand Silk Carpet for its resistance to stains, its resistance to matting or its ability to look like new for years to come, the expert flooring contractors at Floor Expo can help you find the right option for your needs. Stop by our flooring showroom in Fairfield or contact us today to schedule your free design consultation.